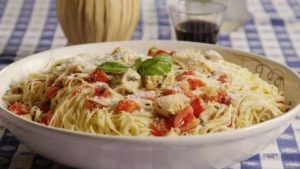 Angel Chicken Pasta a delicious, easy company dish – the flavors are wonderful. Step One : At first, preheat oven to 325°F. Step Two : In a large saucepan, melt butter over low heat. Step Three : Add dressing mix, wine and soup. Step Four : Mix in cream cheese and stir until smooth. Heat through but do not boil. Step Five : Place chicken in baking dish and cover with sauce. Step Six : After all of these bake for 60 minutes. Step Seven : Ten minutes before chicken is done, cook pasta according to package directions and drain. Step Eight : Serve chicken and sauce over pasta. Now you have know the delicious dish recipe with full directions. Make it at your home and enjoy it with your loving family.